← It’s LOVE of money that’s the root of all evil. The money itself is fine. 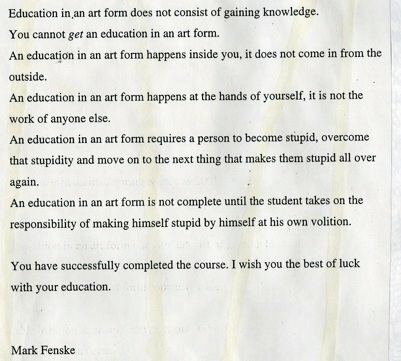 I wrote this when I taught at Art Center College of Design in Pasadena. I gave it out last class of the year. More of the wisdom/crap I shovel on students’ heads to make up for them not being able to point at anything concrete I ever taught them. Just because some of you are getting jobs don’t even start thinking school’s out. There are tougher folks out there than me.